Being an ordained minister, I'm really curious on why and how you equate any Christian faith with freedom... doesn't it say "Thy [God's] will be done"? Human freedom, as a foundation upon which the Christian world-view is built, comes out of the image and likness with which God created us (Gen 1:26). Thus, we are in His image and are capable of being like Him. God is ultimately free — He freely created the world, He freely gave us His image and likeness, He freely gave us His Covenants and freely gave us His Only-Begotten Son who freely went to the Cross. There is nothing that compelled Him against His will to do any of these things. As such, we must be free because we are in His image and likeness. This is why He allows us the freedom to accept or reject Him. Any kind of coercion on His part, whether by arbitrarily destroying evil in the world or through any kind of predestination, would destroy His image and likeness in His creation. Without freedom, we cease to be human — we cease to be the image and likeness of God. When we say "Thy will be done" we are freely choosing to make the Lord's Prayer our own and to orient our lives toward God. We are freely choosing to be the unique and unrepeatable person we are supposed to be — a friend of God. We freely choose the ultimate, unending, inexhaustible and ineffable wisdom and love of God over and above the fallen world. In terms of RPGs, I choose to allow Christ into my gaming and try to game in a way that expresses my faith in Him. I find doing so much easier when the system I play allows for the freedom to play the game in any number of ways. There is no single true way to play our hobby, nor is there ever going to be the perfect system. One of the main reasons for this is because of us. As human beings we all bring something unique to the table. As such, every gaming table is unique. This is not something that is detrimental, it is something to be celebrated. As a result, I find any mechanic that removes this humanity — this uniqueness — takes something away from my game. This is why I choose to play the way I do — using systems that not only allow, but encourage players to go their own unique way. This is a map of one of the sections of the first level of the Dungeon Below. It is accessible from the Tombs in the Southern Ruins. In writing up room descriptions, I have kept things to a minimum in order to allow more freedom and creativity on the part of anyone wishing to use this material. As such, I have followed Moldvay's suggestions on stocking a dungeon. Prior to the room descriptions are encounter tables. These can be used to stock this level and as wondering monster tables. 16. Failed Experiments. This room is filled with bodies and body parts that did not or only partially animated during the experiments the Necromancer from Room 30 has been conducting. At any time there are 2d6 partially animated experiments here. Treat each as a 1/2 HD zombie with a 1 in 4 chance of having a Mark of Chaos. 27. Tombs/Storeroom. This room is full of dead bodies ready for experimentation. Treasure. 30. Necromancer's Lab. In addition to being able to summon 1d3-1 Skeletons per round, the Necromancer has the following spells: Protection from Good, Shield and Mirror Image. Anyone killed by the creature will rise as a "black ooze zombie" in d6 rounds. There was quite a hubbub over at Grognardia yesterday about Descending AC vs. Ascending AC. I find it fascinating that such a small thing can result in such an explosion of emotion and words. The reason for this, I believe, is that underlying this debate is the much greater issue of the universal mechanic, of which AAC is a part and which DAC flies in the face of. If I am really honest with myself, I have to admit that the universal d20 mechanic of 3rd Edition is awfully attractive. In concept, it is elegant, it appeals to my love of patterns and it is so darn pretty. This beauty, however, does come with consequences. By implication, a universal mechanic should be able to handle any and all situations that come up during play — whether or not the use of the mechanic is appropriate or even necessary. A natural assumption that arises out of this ability to handle every thing in play, is the belief that the mechanic should handle every thing in play. In fact, if your goal is to run tournaments that are fair — that reduce the human element to a minimum so that the system practically runs itself — this is even desirable. The die roll is left to handle everything. I believe those of us who prefer DAC (which I do, for a variety of geeky reasons, including weapon vs. AC tables), tend to read more into AAC than a math equation. It reminds me vb of the universal mechanic that has not only successfully reduced the human element of the game, but has also reduced the amount of freedom and creativity in the game. Using the universal mechanic reduces the freedom of the DM to arbitrarily make a ruling based on a d8 or a d12. Using the universal mechanic reduces the freedom of players to role play, to try to solve problems creatively, and to act and think outside the box — because to go outside the box means to go outside the mechanic, which is designed to handle everything. As a Christian, one of the the things I value most is human freedom. It is one of the foundations upon which the whole Christian world-view is built. Without it, my faith means nothing. As such, I prefer the older versions of the game, because they better express human freedom in their game play. It also means that I value the ability for everyone to choose their own path; however, I also encourage everyone to understand the consequences of their choice. Have I played 3rd edition? Yes. Do I enjoy it as much as I enjoy playing older editions of the game? No. I find the free-flowing creativity that results from a deliciously non-universal mechanic to be a lot more enjoyable — in many ways because I'm making it up as I go along. At the end of the day, the choice to use AAC or DAC is loaded with far more than a simple math equation. To choose DAC clearly states that one rejects a universal mechanic and embraces the freedom that comes from the older styles of play. And, as we saw yesterday, those who make that choice can be quite emotional and vocal about it. 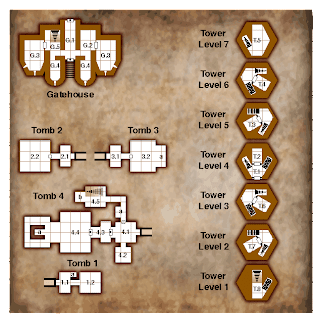 These are maps of the tombs, the tower and the gatehouse found in the Southern Ruins. G.1 Both doors in this room are locked, wooden and reinforced gates. The gate on the eastern side is also sealed shut. Even if the gate is unlocked, it will not open without knocking the gate down. If care is not taken, anyone knocking the gate in will find themselves on the other side of the gate where there is a 20 foot spiked pit. At one time there was a ramp that spanned the pit, but that has long since rotted away. Anyone who wishes to get past the pit will have to rig some kind of bridge or climb the steep rock face on either side of the pit. G.2 Sleeping Area. A total of 8-12 Chiata will be in the Gatehouse at any given time. Half of them will be in this room sleeping. G.3 Guardroom. 1 or 2 Chiata will be here at any given time. They are armed with crossbows and one will be a shadow caster with Darkness 30' radius which they will cast the moment any combat appears likely. This will make targeting the Chiata from outside the gatehouse extremely difficult. Note: this spell will affect the adjacent room G.4 as well. G.4 Guardroom. 1 Chiata armed with a crossbow is here at any given time. G.5 The stairs go down to Room 1 on Map Level 1C. Please note: Tower Level 1 is the ground level. T.1 The exterior door is unlocked and recessed into the wall, creating a small ledge large enough to ge a toe hold. The ledge is a pressure plate that arms a trap triggered when the door is opened. A springloaded blade will cut across the opening in front of the door, dislodging or cutting any climbing devise attached to the ledge. Anyone in the doorway must make two saves. One to reduce the d8 damage of the blade in half, the other to avoid being knocked off the ledge. T.5 This room is open to the sky. The parapets around the room are about 4 feet high. Off towards the north, just over the hills, a strange energy can be seen. It is barely visible during the day, especially the noon hours. However, at night it is impossible to miss. In the middle of the room is a giant glass lens held fast on a stand so that it faces the energy field. Carved into the interior of the lens is the visage of a tentacled flying eye. The stand is fixed to the floor and lens weighs far more than it ought to. The whole area radiates magic. At sunset (and/or any other predetermined or random times the Referee sees fit), the lens somehow focuses the energy field in the north to spot on the southern side of the room. Anyone standing within that beam must make a save or take 2d6 points of damage. A successful save results in a mutation. This can either be determined randomly (using tables from Mutant Future) or by Referee fiat. T.8 The stairs lead down to Room 24 on Map Level 1B. The stairs are protected by an illusion. Instead of stairs, there appears to be a solid floor and at the end of the room there appears to be a niche in the wall containing a golden statue of some cthuloid being. Anyone who moves forward toward the statue will fall into Room 24 below, which is protected by a permanent Silence spell. The rest of the rooms I leave for the Referee to leave empty or fill with whatever they desire. 1.1 Trash Heap. This room is filled with refuse. The Xeraphi who occupy the tombs use this to dispose of their waste. 1.1a Grafitti. Carved into the wall of this alcove are the words: Yog-Sothoth knows the gate. Yog-Sothoth is the gate. Yog-Sothoth is the key and guardian of the gate. 1.2 Ooze Lair. A pool of Grey Ooze has been lured here by the refuse that the Xeraphi deposit in 1.1. 2.1 Guard Room. A pair of Hyenas guard this area. 2.2 Sleeping area. Up to twelve Xeraphi will be sleeping or resting here. 3.1 Guard Room. Four Hyenas guard this area. 3.2 Lieutenant's Room. The lieutenant of the Xeraphi war band sleeps here. He has four Skeletons as bodyguards. 3.2a Treasure. Three locked chests containing a total of 3487 cp and 589 sp and 62 gp has been shoved into this alcove. Two Zombies stand guard and will attack anyone besides the chief who touches the chests. 4.2 Guard Room. Four Xeraphi will ambush adventurers entering 4.1. 4.3 Zombie Room. A pair of Zombies await in the alcoves to attack any one other than the Necromancer. 4.4 Necromancer's Lair. The Xeraphi Necromancer (3HD) can summon 1d4-1 Skeletons per round. She also has a scroll with Protection from Good and Curse. 4.4a There is an obsidian statue of a clawed humanoid with a multi-eyed, tentacled head. Six 50 gp gems are stored in a secret compartment inside the statue. 4.5 Stairs. The stairs go down to Room 1 of Level 1A. 4.5a A pair of Skeletons stand guard. 4.5b A Zombie rings a gong when adventures enter this room, warning those at the bottom of the stair. A couple of summers ago, I went to Mt. Athos — a peninsula in northern Greece that is home to a score of monasteries and several sketes. At the very first monastery I visited, one of the very first icons I encountered was a soldier saint named Prokopios. Armed with sword and shield and clad in mail, I found myself captivated and wondering who this guy was. As I visited other monasteries and worshipped in several chapels, it seemed that I always ended up next to an icon of St. Prokopios. He became a familiar face and I ended up considering him a friend. When I came off the mountain, I vowed read his story and found out that he was a martyr. In our modern era, the word martyr is closely associated with people who die for their faith. We forget that the word actually means witness. This begs the question: what are they witnesses to? The simple answer is to Christ and all that He has done for us. However, there is more to it than that. Prokopios, much like Paul before him, was visited by Christ as he was on his way to persecute Christians. He was confronted with the reality that Truth is not a idea, not a philosophy, but a person who is both God and man. At the center of the Christian faith is a personal relationship between humanity and God and between humanity and itself. Prokopios, by befriending me on the Holy Mountain, reminded me that the image of God in man is not complete without a relationship with our fellow human beings. This is one of the reasons that I write this blog, why I still love this hobby, and why I prefer old school ways. Role playing is about getting around a table with our fellow human beings, enjoying who they are, and what we become when we are together. The old school celebrates our individual quirks in the way it is so easily adapted to our particular interests and prejudices. May this Feast of St. Prokopios be filled with many blessings, and with the fellowship of our fellow human beings (especially at the gaming table). It was fun. The players very quickly adapted to the free style combat rules and improvised quite a bit (they felt free to grapple, shove, use fire and oil and even tried to use spiked club to jam open a giant frog's mouth to avoid being eaten). We all enjoyed the freedom to be able to try out tactics too difficult or burdensome to accomplish in 3rd Edition. We spent more time describing what we were trying to do rather than crunching rules or rolling dice. Abstract simulation works. Everyone in the group found combat sans battle mats and miniatures refreshing. It not only allowed the party to move far more efficiently through the dungeon, it allowed for us to take care of entire sequences with a single roll — something that made sense in context, didn't bog us down in minutia, and allowed us to get on with the things we wanted to spend time on. Old School isn't as random as you think. I didn't allow any Thieves, with the express purpose of forcing the players to talk their way through finding and disarming traps as well as searching for hidden objects and secret doors. The players quickly caught on and each room explored became its own little story as actions were described in detail and rolls were kept to a minimum. Randomness can be highly entertaining. Old School feels more random than modern games, because games are largely unscripted and often made up on the fly. Those things that do get randomized are non-standard and have a way of creating unexpected events. This forces everyone to get creative in order to deal with the new situation — something that more often than not is highly entertaining. Sandboxes are cool. The players got a huge kick out of being given random rumors and being allowed to follow up on any that they desired. It was a bit of an epiphany to be allowed to have the goal of the campaign placed in the players hands, as opposed to having the goal being forced upon them by the campaign. Morale rules work. I used the Maldvay rules for morale and they added a layer of depth to the game even I found surprising. For this group of players, monsters are no longer stupid fodder to be killed by adventurers one encounter at a time. 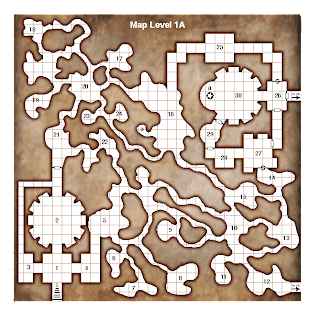 By the way the players reacted to the changing environment of the dungeon as monsters ran away, it was obvious that the morale rule had transformed the dungeon into a living environment that reacted to the players actions. This was no longer a series of encounters, this was a dungeon where danger lurked around every corner. Jason Vey's interpretation of Vancian Magic is excellent not only for old school games, but for new school players. I ported wholesale the magic system from Spellcraft and Swordplay because it fascinated me and I wanted to see how it played. In my experience, new school players are loathe to play spell casters who get one spell per day and feel that they are done and useless. Vey's system alleviates this to a certain extent, because characters have a chance to cast a single memorized spell multiple times a day. However, there is also a chance that the spell will completely fail (and you then forget it) or won't take effect for an entire round. My players enjoyed these possibilities, it kept spell casters active, and it made using any magic a little bit dangerous. Simple rules mean you don't waste your time on rules. On more than one occasion these words came out of the mouths of my players: "Simple, I like it!" Instead of trying to look up the rule in one of several 300 page tomes, we made up a rule on the spot that everyone saw as fair and moved on. Simple rules mean that players can focus on their characters instead of their mechanics. Without skills or feats to worry about, players spent more time figuring out their backstory than trying to figure out how their characters worked mechanically. As play went forward, I also found that the lack of a mechanic actually forced players to role play. Old School is addictive. The players are already talking about how to fit more sessions into their schedule, because they want more. It goes to show that we old schoolers should be playing our game with those outside our community — the things we love about old school gaming are things that everybody else will see they love, too. Contained in these two quotes from the last paragraph of the Declaration of Independence are two appeals to God — something we often forget about. The American Revolution is an anomaly, not only because it succeeded, but because it didn't replace a tyrant with another one. Whether or not we claim that the men who signed the Declaration and later gathered to write the Constitution are Deists, Christians, or whatever, these men had a Biblical understanding of humanity. They understood that we are fallen, that we are subject to sin, and that without God any endeavor is doomed to failure. One need only look a few years after the American Revolution and see all of these things born out in France — tyranny was replaced with tyranny, people were seduced by power, all of the ideals upon which the Revolution was built were trampled under foot as an entire continent suffered. Like many Americans, I am enamored by revolution, by the underdog, and by the struggle against tyranny. It is for this reason, I think, that I find myself going back again and again to the Githyanki and Githzerai and trying to find some way to put them into my games. Theirs is a deliciously cool back story that fires my imagination every time I think about it; however, it is also a story of tragedy. I love the fact that Githyanki and Githzerai are human — mutated from long exposure to the Mindflayers and by their own sin, but human nonetheless. This makes their tragedy more real and closer to home. As slaves seeking freedom from harsh masters (and those masters being Mindflayers is a huge bonus), I can't help but be sympathetic. This struggle, however, has a tragic undertow. They succeed in throwing off their slavery to the Mindflayers, only to fall into the slavery of their own sin. As Chaotic and Evil beings, the unity that they found under the leadership of Gith is rent asunder, and they are plunged into a vicious civil war. Worst of all, their sin and their war threaten the rest of humankind. This is brilliant stuff. Great villains see themselves as the heroes of their own stories. The Githyanki and Githzerai have this in spades. Not only does this add a wonderful flavor to any adventure in which they are involved, but it also means that they are redeemable. It gives the players an option not usually available — to try and save the monster. From a Christian perspective, this is the story of humanity sans God — one repeated over and over again in revolutions throughout history. We are capable of great things — such as unity and freedom. However, because we are subjected to sin, all of our accomplishments will ultimately fail. Only in God can we find true freedom and unity. Only in Christ can we overcome sin. On this 4th of July may we all appeal to the Supreme Judge of the world and have a firm reliance on the protection of Divine Providence. Happy 4th. I just wanted to take a moment to thank everyone who wrote to me over the past week. Thank you for your continued thoughts and prayers. I very much appreciate it. God Bless you.